Background: Chemoprevention is a strategy which uses drugs which are traditionally not used as anti-cancer drugs; however, they prevent the carcinogenesis. Meloxicam (MLX) is traditionally used as a non-steroidal anti-inflammatory drug (NSAID), but it has been proven to have activity against colorectal cancer. Subsequently MLX seems to be a likely candidate to be utilized in the chemopreventive therapy of colorectal cancer. However, MLX poses shortcomings with respect to its dose required to elicit cytotoxicity. To improve the formulation, we used Quality by design (QbD) for optimization. QbD is a method that employs quality-improving scientific methods that build quality into the formulation by isolating the factors which affect the critical quality attributes of the formulation. The aim of the present study was to utilize the principles of QbD to formulate MLX into a formulation so as to exploit its potential to the fullest. Methods: Conventional (CLM) and PEGylated liposomes (MPL) of MLX was prepared using hydrogenated soya phosphatidylcholine (HSPC), distearyl phosphatidyl glycerol (DSPG), cholesterol and 1, 2-distearoyl- phosphatidylethanolamine-methyl-polyethyleneglycol conjugate-2000 sodium salt (MPEG 2000 DSPE). The liposomes were prepared using thin film hydration method. The optimization of the formulation was done by employing the QbD approach. The formulation was optimized on the basis of the factors which were affecting the critical quality attributes (CQAs) such as particle size and entrapment efficiency. The final optimized formulation was characterized by assessing the particle size, percent entrapment efficiency, zeta potential, long-term stability, morphology, in vitro release and in vitro cytotoxic activity. Result: PEGylated liposomes having high percent entrapment efficiency (87.25 %±0.72%) could be obtained. The entrapment of drug in the liposomes was confirmed using Differential Scanning Calorimetry (DSC), Fourier Transform Infrared spectroscopy (FT-IR) and Powder X-Ray diffraction (PXRD) studies. The mean particle size of the liposomes was 113 nm±67nm and they were found to exhibit sustained release profile (56.59 %±0. 43% drug in 24h). The Small Angle Neutron Scattering (SANS) analysis revealed that the liposomes were uniform sized LUVs (nm) and were spherical in shape. The shape of the liposomes was further confirmed by transmission electron microscopy (TEM). Long term stability study indicated that the formulation was stable for three months. Sulphorhodamine B (SRB) cytotoxicity assay was carried out in HT-29 cell to prove that the PEGylated liposomal formulations had higher cytotoxicity than the conventional liposomes after 48 hours of incubation. Conclusion: The study affirmed that MLX loaded PEGylated liposomes had superior in vitro cytotoxicity as compared to the free drug as well as conventional liposomes. 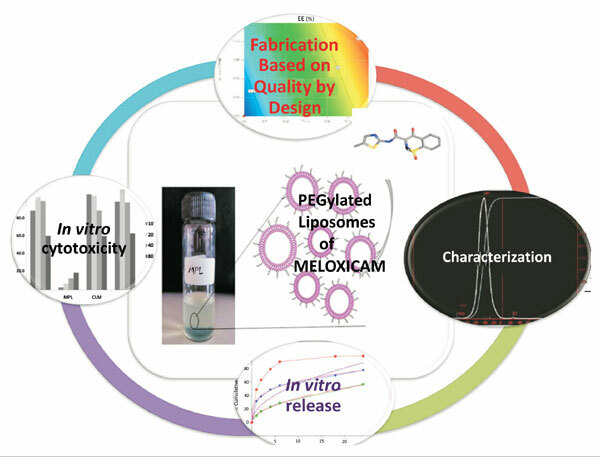 QbD resulted in the fabrication of a stable liposomal formulation with all the desirable characteristics. Hence, MLX loaded PEGylated liposomes can be considered to be a promising system for the delivery of MLX. Keywords: Colorectal cancer, chemoprevention, cytotoxicity, in vitro, meloxicam, PEGylated liposomes. Keywords:Colorectal cancer, chemoprevention, cytotoxicity, in vitro, meloxicam, PEGylated liposomes. Abstract:Background: Chemoprevention is a strategy which uses drugs which are traditionally not used as anti-cancer drugs; however, they prevent the carcinogenesis. Meloxicam (MLX) is traditionally used as a non-steroidal anti-inflammatory drug (NSAID), but it has been proven to have activity against colorectal cancer. Subsequently MLX seems to be a likely candidate to be utilized in the chemopreventive therapy of colorectal cancer. However, MLX poses shortcomings with respect to its dose required to elicit cytotoxicity. To improve the formulation, we used Quality by design (QbD) for optimization. QbD is a method that employs quality-improving scientific methods that build quality into the formulation by isolating the factors which affect the critical quality attributes of the formulation. The aim of the present study was to utilize the principles of QbD to formulate MLX into a formulation so as to exploit its potential to the fullest. The Plasma microRNA miR-1914* and -1915 Suppresses Chemoresistant in Colorectal Cancer Patients by Down-regulating NFIX.